Edward Oakley was born around 1795 somewhere in the vicinity of I suspect Worcestershire aka Staffordshire (depending on which side of the road you were standing on). At the age of eight he went down into the coal mines at Wednesbury in Staffordshire. One of the towns of the black country region and a mere 7 and a bit kilometres from Dudley in Worcestershire. If his family were from Wednesbury then it is likely his family church was St Bartholomew’s. I say this with some confidence as it was the only one standing in 1795 in what was a rather grim little hamlet. The only people making decent money in Wednesbury were the mine owners and operators and landholders. Poor land and environmental conditions, dismal water supply and harsh conditions all contributed to make this little bit of landlocked England a tough place to call home. Coal and iron ore mining with their ancillary occupations of nail making and carpentry were the main occupations. Work was available but the conditions often dangerous and harsh. If the workplaces themselves were dangerous the local environment was doubly so. Immense pollution in a countryside that was so named because it was black during the day with smog and dirt and then glowed red at night from the smelting works. There was no pollution management at the time and the operators of these businesses had free reign to scar the land and its inhabitants as they saw fit. Eventually the land area that incorporated places like Dudley at it’s centre became known as The Black Country. A name it holds still today. Sometimes when you least expect it and after many a dead end you find some little remnant of the life our ancestors had. Very rarely do you get to hear them speak in their own words. By sheer good fortune on this occasion we get to hear Edward speak. A paper was published in 1841 following an extensive investigation of some years by James Mitchell on the working conditions of children in the coal and iron mines of South Staffordshire (Worcestershire) and their subsequent treatment. I am now nearly 40; I first went down to the pit at 8. I had to carry slack back to the gob and wait upon the men. I was an apprentice to a butty collier. I never received any wages till 21. I served 13 years’ apprenticeship. I was bound when I first went down. I think apprenticeship a very bad thing. Butties get apprentices from parishes and their own children to learn other trades. Some apprentices are used very rough; some have better places. Very little play to a butty’s apprentice; always kept to full employment. Some are pinched very sharp; in other places they are well fed. They are clothed very indifferent, very shabby. In some places, they are well lodged; in others, the butty is very poor and has not wherewith to make things comfortable. The boy would learn his trade just as well if he were not an apprentice; not a morsel of difference. Sometimes fathers bind their own children, being induced by the present of a suit of clothes, or a watch, or some other enticement. I had 13 years. of it. It was a hard time. The last part of it though very hard. There is a butty close by here who has 10 or a dozen apprentices at a time. The butties here in general do very well and build lots of building. The apprentice can learn nothing. The colliers are very ignorant, being always buried alive in the pits. The butties never put their own sons to be colliers but send them to learn other businesses. I was an apprentice at Wednesbury, two miles from here. I never knew any child under 8 sent in to carry out slack; it is very hard work. A lad ought not to go down into the pit before 10. It is full young enough. It hurts a lad’s health if he be worked hard; and there are very few who are not worked very hard. I took to horse-driving at 12 years of age and kept at it till I was 15. I then began to work with a pick and to get the coal. I holed and cut away the bottom. Lads at that age are not allowed to try to cut down the coal. About 17, I began to take my turn, and earned for my master 4s. a-day; that is, I worked as much as would have come to 4s. if he had paid for it and kept on that way until 21. The drink in the pit is pretty poor but some is very tidy. The greater part of it is not worth a penny a quart but the butties reckon the beer they give as worth 6d. a-day but it is no such thing. The pickman’s work will take a man, one day with another, eight hours to do a day work. Sometimes it is more time, and frequently less. I pay 3s. 1d. for my house-rent. We have coals allowed and the coals are drawn and laid down at the collier’s house. We have to pay for the drawing, according to the distance. It is not common now for the wives to bring home the coal but it used to be so. For miles round it is quite a regular thing to have the coals drawn. In some collieries it is not so. The master and the butty together find the coal; that is, the master loses his coal, and the butty loses his charter for digging them. The colliers have the coal at which they are working that day; if top-coal, they get top-coal; and so on. The coals are sent home. Our bed of coal, when regular, is 10 yard thick but sometimes runs 12, 14, or 15 yards. The masters here screen the small coals, to rid them of the dust and use the screened small coals for the engines. The dust sets fire to itself on the bank. If it had air enough within it, it would not fire. We have fallen in with a chance coal, just above the thick ten-yard coal, which made together twenty-yard coal but it did not extend far. The boys in the pits are more exposed to danger than the men, because they do not know when they are going into danger. This is a very fiery country. A Mr. Ryan, 15 years ago, tried to bring up a regular supply of gas. What he meant to do with it people did not know. He tried to get it up in pipe into the hovel but he failed in his endeavour. We have frequent explosions. The iron chains are not so good as hemp. We never know when the iron is to break; but the hemp shows when it is getting bad. There is a great deal of religion here. There are pits in which there are prayer meeting every day after dinner and walk with any who do not. We have had preaching down in the pits. That has been the cause of turning many a poor sinner to God and to amendment of their lives. Many a one goes down into the pit to hear the preaching. When there is any prayer or preaching, the master allows five minutes beyond the hour. In most pits there are laws against swearing when the people are in the pit and the men that swear lose their beer. There is very little public breaking of the Sabbath. The policemen are very useful and stop all irregular proceedings. There are Sunday-schools for the children to go to, if the parents will send them. Six is the usual number that goes down at a time. We stand upon the skip. Web site:- http://www.cmhrc.pwp.blueyomder.co.uk. Edited by Ian Winstanley 1998. It’s completely without semblance of sensibility to me that swearing could lose you benefits but sending children and men into life threatening and health damaging situations every day of their lives didn’t appear to raise an eyebrow. Coal mining terms: (for those of us who don’t know our butty from our collier). I imagine I can hear the bitterness in Edward’s voice when he talks about how the apprenticeships are made and I suspect from this that his father may have put him into indentureship given the tone of his voice when he talks about “I’ve had thirteen years of it,” referring to his years from 8 to 21. Edward married Hannah Haden a native of the Dudley area on the 13th of August 1815 at St Thomas Church in Dudley. They went on to have their five children in Dudley and each of them was hauled across to St Thomas in turn to get recorded in the parish register. Sarah Oakley b. 1816, Mary Oakley b. 1817, Elizabeth Oakley b. 1819, John Oakley b. 1823, Ann Oakley b. 1827. Hannah herself has proved a bit tricky to trace; trying to find the name Haden/Headen in the area so far has not brought me much success. There were mines in Dudley like the ones in Wednesbury and I don’t think its too much of a stretch that Edward who was working between the different mines as was common in the day, eventually made his way to Dudley where I suspect he found Hannah waiting for him. There was no sewerage to speak of in Dudley, the whole are was land-locked. The water supply heavily polluted not only from the everyday muck of peoples lives but also because of all the slag and waste from the coal and iron ore mines. Not surprisingly cholera was a frequent visitor to the surrounding districts. In 1831-1832 cholera overtook the county and Dudley was particularly badly hit. So many people died as a result of this outbreak that the churchyards in St Thomas and nearby St Edmund’s were completely full. It became necessary to bury the dead at Netherton four kilometres away. Netherton itself was no stranger to choleric outbreaks suffering like the other black country towns with the lack of adequate water and drainage. Even the churchyard at Netherton struggled to cope with the numbers of dead being brought in on a daily basis. The dead were being collected at night by carts going from house to house so as to try and reduce the terror of the living. The burials were done at night as bodies were tipped from the carts into the ground and quickly covered. Funerals were not held during this time mainly to try to reduce the spread of the infection and secondly because of the sheer volume of the dead who needed to be buried. In this one outbreak up to 600 people died from Dudley alone. Cholera continued to have outbreaks in Dudley and surrounds up into the 1880’s when finally decent drainage went in. I have found conflicting records of a Hannah Oakley who died in Dudley in 1831 and then I have found a record of Hannah Oakley who died in Dudley in 1838/1839. Youngest daughter Ann and her father were the only inhabitants at the home in Kate’s Hill (an area of Dudley) on the 1841 (census) and Ann was listed as being ten. However having been born in 1827 she was actually thirteen or fourteen. Could these recurrent cholera breaks be part of the reason I’m having so much trouble locating exact dates and even information on most of Hannah and Edward’s daughters? Likewise I can’t find them buried in the the St Thomas churchyard – however there are also a lot of ‘unnamed folk’ in the St Thomas churchyard and of course thanks to 1831’s events it was now full. I have had an almost impossible uphill climb in trying to find information as to the deaths and whereabouts of and in particular Hannah. I would like to put in this short quote from possibly one of the most remarkable websites I have come across in many years that may help explain this – if this is the effect indeed on our Oakley’s. There are an immense number of graves which portray the circumstances which prevailed in the early 19th century, for example. Large families were extremely common in the Black Country and housing conditions were predominantly poor. Cholera had a massive impact on the area in 1832 when hundreds of people died. The worst affected areas were Dudley, Tipton and Brierley Hill. 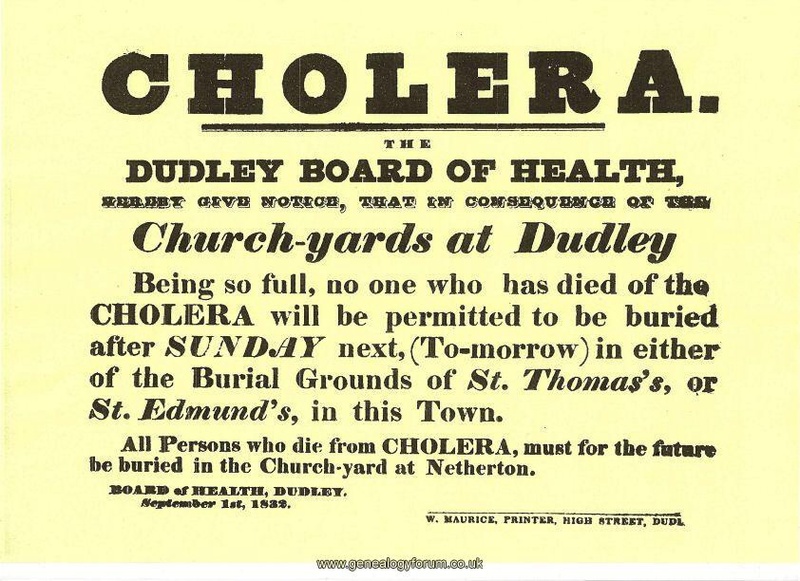 The Dudley Board of Health put out a notice on 1 September 1832 that on the following day, Sunday, no one who had died of Cholera would be allowed to be buried in either of the Burial Grounds of St Thomas or St Edmund because they were so full. Those who died from Cholera after that date had to be buried in common graves on the north east side of Church Hill, Netherton. No records were kept for these mass burials. On the 6 June 1841 census, John was living at Freebodies Lane, Kates Hill, Dudley, Worcestershire, England He is recorded as as Coal Miner. Also living at the address is Ann Oakley recorded as aged ten. At this time John’s age is recorded as 45 years of age. Census notes that Edward was not born in the local county. By 1842 given the scant records I have been able to find, I presume that Edward is dead. John was mouldering away in a hulk in London waiting to be transported to Australia. As to Edward and Hannah’s daughters, I have found Ann having married a John Edward Turner and living in nearby West Bromwich in the1861 census. They had a daughter, Eliza. Sarah, Mary and Elizabeth are proving a bit of a mystery at this time. As to Edward’s final resting place? I am almost certain that given he was living in Kate’s Hill (Dudley) at the time of the 1841 census that he would have almost definitely been buried at the newly opened and nearby St John the Evangelist in Kate’s Hill. St John’s was opened in 1840. Should John have been laid to rest here then he would have been one of the earliest interments. It is possible (but unlikely) that he may also have been buried at St James in Eve’s Hill that was also opened around the same time. The people of Dudley had run out of places to lay their departed and these new churches and churchyards were opened with great appreciation from the local inhabitants. St Johns over the last few years has been caught up in a desperate attempt to preserve it and keep it intact since it’s closure in 2002 (for safety reasons). It’s to be hoped that these valiant challenges are successful. One of the other problems is that given the extreme age of John’s burial to now; his headstone (if he had one) may have been damaged or removed. To date I have not been able to locate him in the records. The search continues. In response to my enquiry. Your enquiry regarding cholera victims in Dudley has been passed on to Dudley Archives and Local History Service. Regrettably there is not a definitive list of Dudley victims of the 1831/1832 Cholera epidemic in our collection. There were also further epidemics in 1849, 1854 and 1856. As civil registration did not begin until September 1837 there will be no death certificates so the only possible indication that Hannah or her daughters may have succumbed to the epidemic would be if that information was recorded in the church burial registers but would rely on the cleric of the day doing so. In 1832 the people of Kates Hill, Dudley would have used the ancient parish church of St Thomas’s at the top of the town as Dudley, St John’s did not open until 1844. I have checked the transcriptions of the burials at St Thomas’s for the name Oakley between 1831 – 1832 and found a burial for an Eliza on Oct 9th, 1831 aged 9 mths and a Nancy, Aug 5th, 1832 aged 49 yrs. Nancy can sometimes appear as a derivative of Hannah. I double checked both entries in the original register but there was no indication to the cause of either deaths so it remains inconclusive whether they are your ancestors. We know that once the church graveyards were full many victims were buried in mass unmarked graves elsewhere. Dudley, St Andrews was consecrated in 1830 as a chapel of ease to St Thomas’s and I believe many victims were buried there. The burial records for St Andrew’s do not begin until 1842 and there are no references to the cholera victims in the index to other records we hold for the church or in those we hold for St Thomas. Given the number of people who died and the speed at which they were buried I have, as yet, been unable to establish whether every death was recorded in the church registers. Without additional information about Hannah or her daughters, I regret I can be of no further assistance on this occasion but please get back in touch should you find anything new during the course of your research. Our research service currently costs £21.00 per hour and details can be found on our website below along with lists of our church record holdings and access to our online cataloged.